The 1960s produced many, if not most, of the Mopars that car enthusiasts still desire and search out. In terms of rarity and reputation, at the top of that pantheon of power were the limited-edition Super Stock packages. 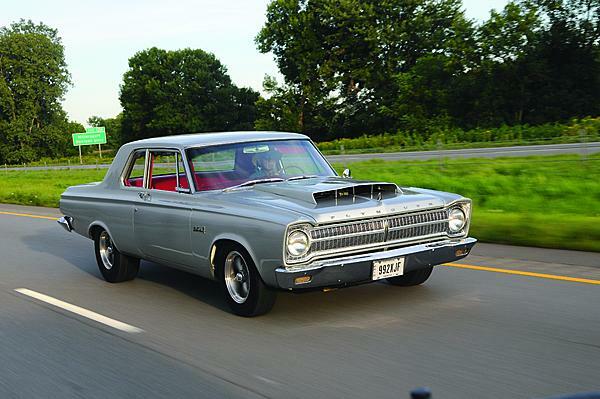 Between 1963 and 1968, Chrysler created special race-only vehicles that were modified with hotter hardware than anything that could be found on the showroom floor. Many of these cars paid dividends over the course of decades in actual racing action and a handful even ended up on the street. For Union, Ohio, car aficionado Dave App, the solution to having such a vehicle, though, was to build one from scratch. At that time, Kossuth, who is a very active nostalgia racer, had over 500 earlier Mopars at his Missouri-based resale and parts business, Clay & Sons LLC. 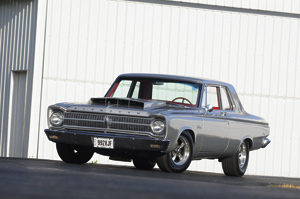 One was a very clean 1965 Plymouth Belvedere. As sold off of the new car lot, the car was built with a 225-cid “leaning tower of power” Slant Six and a three-speed column-shift manual transmission. Dave realized the solid car would be a terrific beginning. He drove 1,200 round-trip miles to the Show-Me State to bring the vintage Belvedere to its new home. The original six-cylinder headed out into the parts pile. In its place, Dave went big, choosing 528 inches of Mopar Performance Hemi crate motor to go between the fenders. He also selected a Keisler five-speed Perfect FIT TKO600 kit to back it up and a Dana 60 out back with a 3.54 gear. This was turned over to a build shop who, Dave now recalls, was probably not his best choice. Let’s just say it was an expensive learning curve. After that not-so-cheap trick, the Plymouth went on to find a much brighter future, literally. The bodywork was handled by Ben Wolf, who added a circa-’65 replacement hood scoop and covered the metal with Mercedes 01 Brilliant Silver paint. The appearance is augmented by American Racing “Rev”-type wheels and Indy 500 brand tires. The suspension was upgraded by Richard Doane with new torsion bars from Mancini Racing, a new steering box from Steer & Gear, and slotted rotor disc brakes on all four corners supplied by The Right Stuff. The rear suspension remains basically stock, with air shocks for ride control. 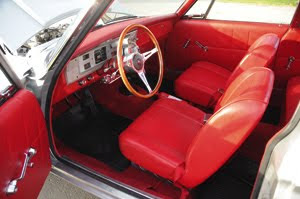 Inside, the car was outfitted with a Super Stock-style interior, plus a LeCarra steering wheel, the Keisler floor shift, and Auto Meter tach and gauges. A dash-mounted switch activates the very cool Quick Time Performance exhaust cutouts that were spliced into the full tti exhaust system. The car has not been down a racetrack, since Dave prefers to leave it as a mechanical bazooka that he carries down to the ice cream store on weekends. He has had the car for 10 years now, and the money and effort expended during the three-year build clearly shows when he displays the car. For the most part, however, it’s not just about looks. Dave has been able to enjoy driving this tribute to the “roaring ’65s” on both boulevard and highway, thanks to the overdrive package. In mining, staking a claim requires proof and purity. Dave’s silver gamble resulted in something that would be treasured by whoever owned it. Parts for that soap box muscle are quite rare. Here in UK, it gets worst, the parts catalogue on cylinder heads uk are always sold out. I'm thinking of trying American car parts site. In addition to recent rumors of her engagement to longtime beau Jamie Hince, Kate Moss is continuing her long lasting relationship with another somebody — Longchamp. Her latest collection of michael kors outlet bags for the brand, under the Kate Moss for Longchamp label, sees her foraying into more summery territory Longchamp than previous collections — think oversized woven bags, satchels, plus her signature leather buckle bags. The lookbook, shot Coach Outlet Store in Morocco by Alasdair McLellan, shows Moss in a groovy fringed 'do, sporting kaftans, wrap dresses, crochet tops, coach purses wide-legged trousers, and of course — her bags. Kendall and Kylie's clothing collection is jam-packed with wearable separates coach factory outlet that aren't only comfortable, but recognizable. The Jenner sisters design looks that they'd actually wear, and every so michael kors outlet often, they do, offering up styling tips so easy to pull off. The two combined their styles, "Kendall's michael kors outlet online signature feminine tomboy look and Kylie's dynamic edge," to create a Fall 2016 handbag collection that will pretty michael kors outlet online much satisfy everyone's taste.The 18-piece bag addition includes structured satchels, sophisticated cross bodies, and on-trend leather backpacks. Kendall Michael Kors Purses and Kylie also added fun, furry charms to the collection, perhaps as a nod to Kendall's love for Longchamp Handbags her Fendi Karlito charm. The range retails from $75 to $450 and is available on Saks Fifth Avenue's Michael Kors website today. Frontier Airlines Phone Number is absolutely toll-free and and offers the best deals on flight booking. It can be reached for help anytime you require it. The experts available at Frontier Airlines Phone Number understands customer concerns and acts accordingly.